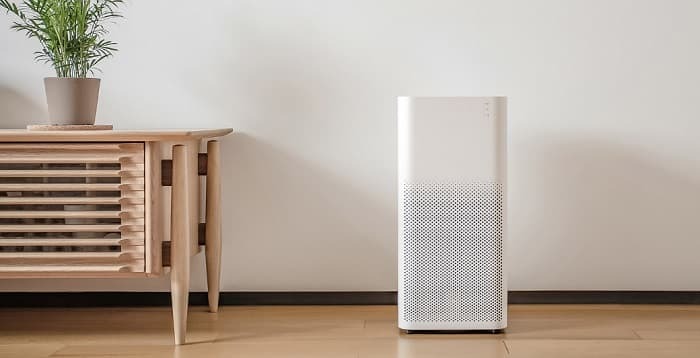 Xiaomi has recently released a new air purifier, named Mi Air Purifier 2, which is now available for sale at a price of Rs 9,999. The product featured on the Mi India's official website, has been put up for sale starting today. This purifier is an upgraded version of its predecessor - Mi Air Purifier and comes with new features like – Real AQI Monitoring, Smart Remote Control, etc. Mi Air Purifier 2 has a compact design and has been reduced in dimension by 40% in comparison to its predecessor - the Mi Air Purifier. It has a width of 240 mm and a height of 520 mm and weighs around 4.8 Kgs. Although being minimized in the form factor, it provides a Clean Air Delivery Rate (CADR) of up to 310 m^3/h. It means that it purifies a room with an area of 21 m^2 in just 10 minutes! Perplexed by its efficiency? Then get ready to be astounded by its aerodynamic pressure system as well. Inspired by the design of aircraft engines, the system comes with a sufficient power to expel the purified air over an angle of 360 degrees. Its triple layered design extracts out dusts larger than 0.3 µm in size and activated coconut based carbon filter removes formaldehyde and other harmful materials. It takes a maximum time of 11 min and a minimum time of 4 min to circulate fresh air in a 23 m^2 and a 7 m^2 room which in itself is an example of its true efficiency. Generally, with more duty, more power is required. But Mi Air Purifier 2 breaks all the barriers by saving enormous power. 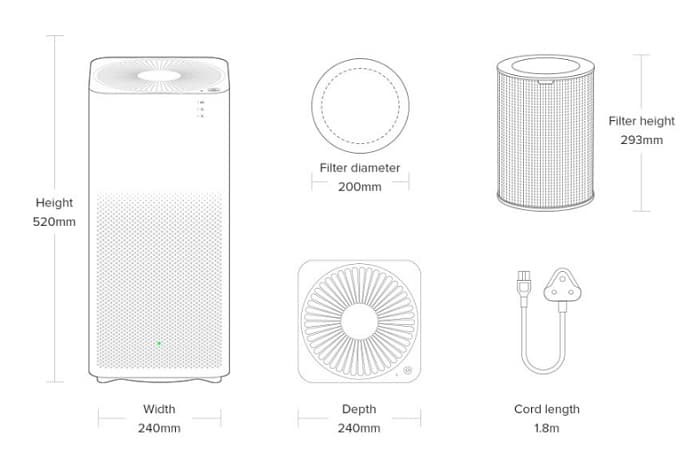 It is a smart air purifier with IoT based features. 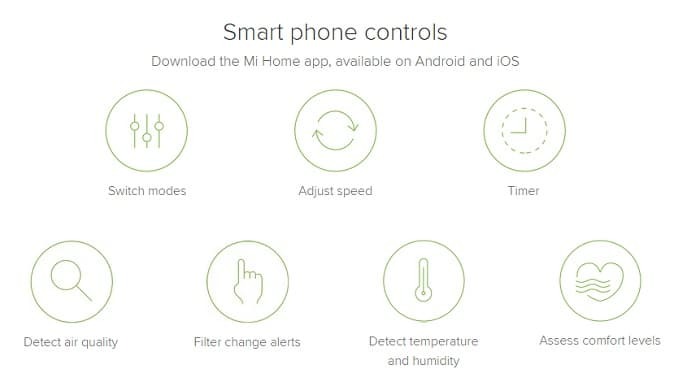 Not only can you control its activity using the Mi Home app, but you can also monitor the air quality of your home. Users can easily introduce timers and schedulers which can control the on and off schedule of the air purifier. Traditionally, air purifier users suffer from the noise that the motor makes. Thankfully, this new release from Xiaomi has succeeded in overcoming that. Inbuilt with aerodynamic Nidec motors, the machine consumes 58 % less energy and only 4.8 watt of electricity on normal mode. It's safe to say that Mi Air Purifier 2 comes out as a clear winner in this category. Featuring a built-in Wi-Fi module, air quality sensor, temperature and humidity sensor, the Mi Air Purifier 2 is truly a smart device. 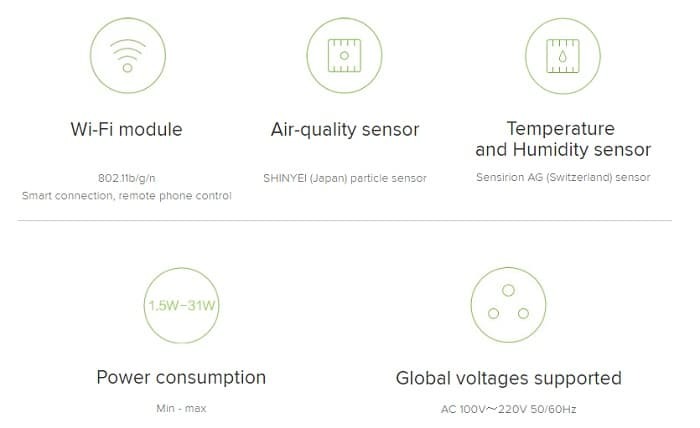 Its smart control application provides filter change alerts, air quality detection, etc., as mentioned in the graphic below. Overall, with new features, Mi has gifted us with a new device at an amazing prize. With the level of pollution rising high, the demand of an air purifier is becoming more common. However, those who are waiting for a smart and efficient air purifier, can definitely take a look at it. The rest is all assured by Mi Purifier 2, which comes with a certification approved by the Guangzhou Microbiology Testing Center to give a treat to your lungs with fresh air and your pocket with less costly bills. What are your thoughts about the all new Mi product? Let us know in comments below. I wonder if we can create a small prototype of this instrument in cost effective manner. No offense, but the price is way more than what I will pay to buy one for my home.